Feta is a crumbly, salty Greek cheese made from goats' or ewes' milk. It is often used in salads and is great eaten with fresh fruits such as grapes. 1. In a large skillet, heat olive oil and saute onions until tender. Add tomatoes, parsley, salt, garlic and pepper. 2. Cover and simmer for one hour, stirring occasionally. 3. Preheat oven to 350F. Divide the prawns and sauce in individual clay pots or put all in a large heat-proof casserole dish. 4. 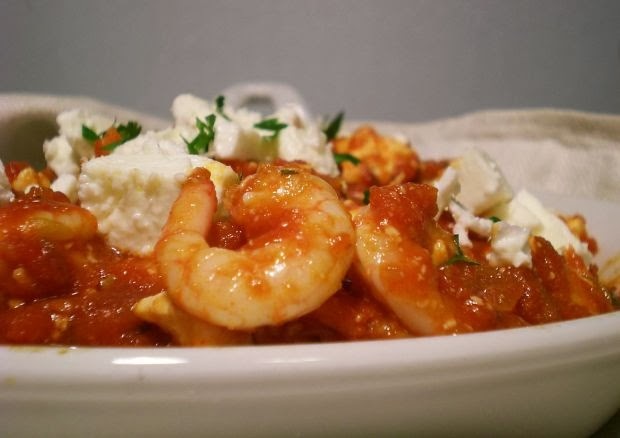 Crumble feta cheese on top and bake, uncovered, for 10 to 15 minutes, or until prawns a re cooked. Garnish with parsley and serve hot.